Earl Mountbatten of Burma (born Prince Louis of Battenberg). Uncle to Prince Philip and second cousin to Elizabeth II. British naval officer and the last Viceroy of India. 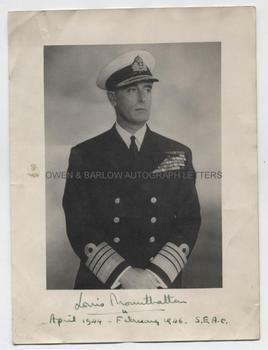 Photograph, signed Louis Mountbatten in the lower white border. With the words added in his hand "April 1944 - February 1948. S.E.A.C." The photograph shows Louis Mountbatten half-length in the uniform of a British Rear-Admiral, looking to his left with hands clasped. The photographer is not known. Approx 9.5 x 7 inches (including white border). There is an old glue spot in left white border (not touching image and probably a result of previous framing) and an impression of a paper clip at top left edge (again, not touching image). Slight creasing and with some foxing spots to verso. Overall, in very good condition. Louis Mountbatten was appointed by Churchill as Supreme Commander of the South East Asia Command (the S.E.A.C. of Mountbatten's inscription), a post he held until it was disbanded in 1946. Mountbatten had a distinguished war record, both as a Commander of the destroyer H.M.S. Kelly and in the planning and organization of the St. Nazaire and Dieppe raids. After the war, he was the last Viceroy of India and the first Governor-General of the indipendent Union of India. He was a favourite of Churchill but the two fell out over the question of indepenence for India and Pakistan and never spoke again. Louis Mountbatten was assassinated by the IRA in 1979.